Recently I had to go to London on business. It sounds so grown-up, doesn't it? Prior to this part of my U.K. trip, I had already taken a memorable 37 mile ride through the English Countryside. Now I was in London, and I began the business trip phase the way most others do: by ironing my suits in a hotel room while watching BBC One...or possibly Two. Then I had to figure out how to get to my destination, how to meet the people I was supposed to meet and eat the things I was supposed to eat (i.e., fish and chips) while doing all kinds of Productive Grown-Up Things for three days. In London, when you're far from your own bikes and are coping with a five hour time difference, it can be an exhausting time. London, just like the great cities of Paris, Boston and Washington D.C. and a few others I haven't visited, has a bike share. This one is sponsored by Barclays. I'm normally irritated at financial institutions that overpay its executives, but if they financially support a good a bike share, I'll often let it go. Now you might assume that a cycle share might only be used by Londoners who can't afford Bromptons, but you'd be wrong. I've been in London a few times since the bike share there began, and I can see the bikes being used by absolutely everyone – from people in suits to people in shorts. If people are cycling in groups of two or more, I often hear languages that aren't commonly taught in U.S. public schools. I also pick up American accents here and there, which is a giveaway that people can in fact visit London and use the Barclays bike share. If you're in London on business, you might think to yourself that you don't have the time to take a liesurely ride in your travels and your hotel and your Productive Grown-Up Things are too far away from each other (or too far from a docking station) to use the bikes at all. That's what I thought too, but I spent the five pounds for seven days of access, and the knowledge that I could use the bikes brought tremendous pyschological value. No matter how bad my feet hurt at the end of each day or how annoyed I was at the work I had to do, simply walking by a docking station would make me break into a smile. In addition to the access charge, there is a charge for rides longer than 30 minutes in length, and even that is low: up to an hour is only one pound. If you choose to not return the bike at all and bring it back to the states as a souvineer, the non-return charge is 300 pounds. Not that I'm suggesting anything. 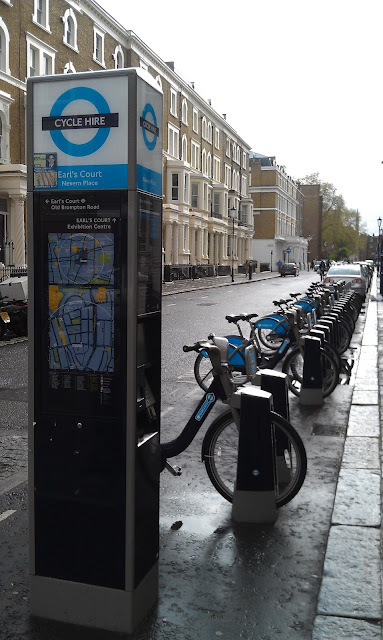 So if you have a trip to London coming up, immediately log onto the Barclays Cycle Hire site. If you're in town for a week or less, the seven-day plan is the one for you. You can buy it before the trip and the seven-day period doesn't start until the first time you undock a bike. 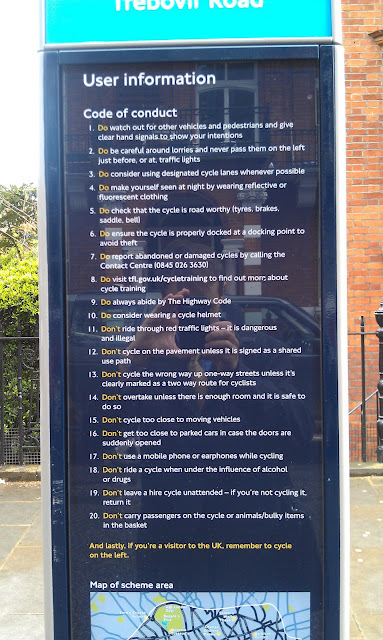 The site also encourages you to read through the rules of cycling when using the Barclays bikes. The rules include: Cardio, Check the back seat, Don't be a hero, and Beware of bathrooms. Wait – those are the rules from the 2009 hit film Zombieland. The rules of the Barclays cycle scheme (which they call 'codes of conduct') are on their site and helpfully printed on each docking station. My favorite: don't ride with animals/bulky items in the basket. When you have a break in your Grown-Up Things schedule (I had two!) you can head to any station and start with the touch screen. I brought the same credit card I used when I registered for the scheme and was easily able to get the machines to print out an essential piece of paper that bore the six digit code that you must type into the three digit keypad next to a bike to release it. It goes without saying, but make sure there is a bike in the docking station before you begin. As it says on the slip, the code only works for 10 minutes, so any DIYBIKING.COM visitors who go to London and try typing in the code above will not be rewarded with a bicycle. My first use of the scheme was so brief it isn't worth mentioning here (I was wearing a suit and, as it does so rarely in London, began to rain heavily minutes after I started using a bike). The second time I was on my last day in the U.K. and found myself near Kensington Gardens. I had less than an hour before I had to go meet my wife but thought a little ride would be good for me. Thankfully, cycle hire docking stations have maps showing you the likely time demands of walking versus cycling. 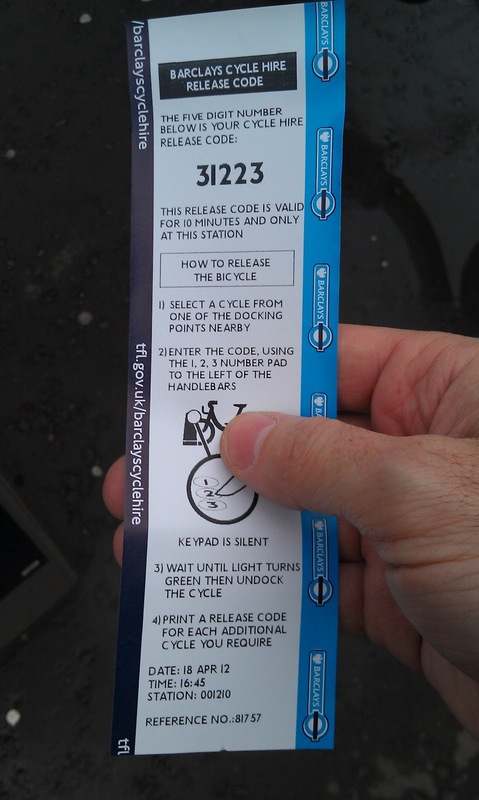 I studied the map of the docking station I was using, and, after careful consideration, chose Bike # 21406 for my ride. It also, of course, has a basket for your briefcase or pocketbook and a big bungee to hold it all in place. The three speed shifter on 21406 was also smooth operating as I headed through Kensington Gardens. I rode politely (I still used the bell from time to time) and mindful that I wasn't wearing a helmet like so many others, I rode slowly. It was just nice to be on a ride – and to always be close to places that had maps. Once again – and this is so incredibly rare for London – it began to rain not long after this photo was taken. But I needed to wrap up my ride anyway and easily redocked the bike at a station before heading back to the tube station to meet up with my wife. The way I figured it, I spent about $8 in U.S. currency and ended up riding for less than a half hour. But again, it wasn't about the distance traveled, but rather the ability to do what so many others don't: taking a ride in a great and unfamiliar city...and tiring myself out before an overnight flight.